The Sims 4 Movie Hangout Picked & Profit? So off to the forum I go and ask the question. Mightydan, in his second reply to my seemingly dumb questions, tells me that there is no relevance it’s just the developers trying to be funny. Right, ok. Not really sure why that’s funny but maybe someone else can enlighten me a bit further. Ceejay402 soon replies and explains that there is a TV Show called American Pickers which the devs must have used for their funny. I’ve never heard of this show so quickly read up on it thanks to the link she provides. Apparently a couple of US guys go around raiding peoples’ sheds, garages, attics (you get the picture) for anything they can buy and then sell on at a profit (like that format hasn’t already been done to death in the form of Storage Hunters/Baggage Wars/Cash in the Attic/Pawn Stars and god knows how many other crappy “reality” shows). But wait, there’s more! According to simgirl1010 the descriptions are relevant to all those who have played previous versions of the Sims franchise. I’ve played all previous versions and I have no idea what the relevance is but as she stated, the Sims mentioned are in earlier releases. I have never given a rat’s arse about any of the pre-made Sims, I barely give a damn about my own Sim. But fair enough, it seems to be a bit Easter Egg like which is cool. 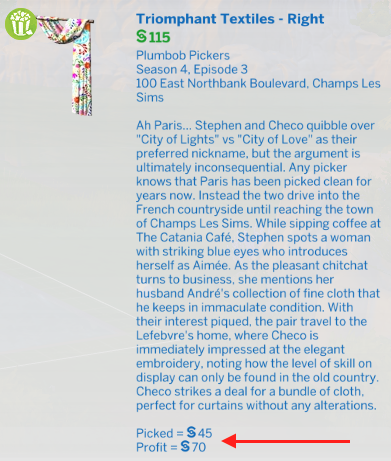 It’s just a shame that they have no relevance to this game, the Sims 4, because from the way the descriptions have been laid out it seems like there is something there to add to the game. Which there isn’t. (For anyone here in the UK who’s as baffled as me, American Pickers can be found on the History Channel and Dave).